The National Space Strategy aims to achieve the UAE’s vision in the field of space exploration, technologies, and applications. It also constitutes one of the pillars of the regulatory framework for the space sector in the country which consists of four components; National Space Policy, Space Sector Law, Space Regulations, and National Space Strategy. Shaikh Mohammad said that the UAE was at the forefront of space exploration thanks to its young Emirati talent. “Last year we celebrated the launch of the first satellite fully built by young Emirati engineers,” said Shaikh Mohammad. “And in the very near future we will see them operating international space technology centres, based in the UAE. We will see Emirati cadres, highly skilled and specialised in space science, achieving scientific breakthroughs that serve the entire humanity. 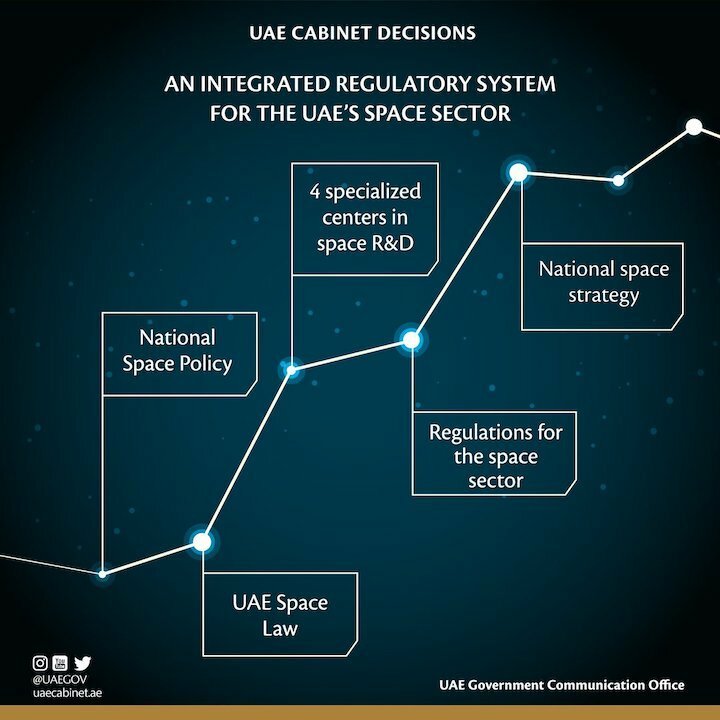 The strategy sets the general framework for UAE’s space industry and activities up until the year 2030, including government activities related to space, commercial activities, and scientific activities carried out by public and private sector operators and academic institutions and research and development centres. The Cabinet stressed the significance of raising awareness about the importance of the space sector among Emirati youth, and of enhancing the role of advanced national research and development centres. The UAE possesses today four specialised centres in the research and development of space, all of them have manufacturing capabilities, and Emiratis represent more than 50 per cent of the workforce, with more than half of them being women. 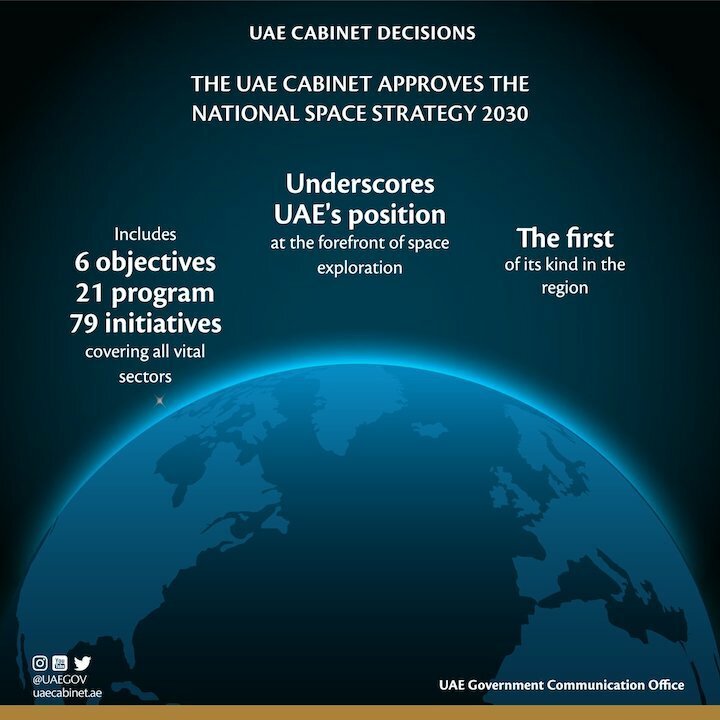 The National Space Strategy includes six objectives, 21 programmes and 79 initiatives, which translate into focus areas and programmes benefiting more than 85 entities in the UAE. The Emirates Space Agency is responsible for following up the implementation of the strategy in cooperation with strategic partners and more than 20 agencies and space centres abroad. The UAE Cabinet also approved regulatory framework for the issuance of five and 10-year UAE residence visas to certain categories of applicants on Monday. His Highness Shaikh Mohammad Bin Rashid Al Maktoum, Vice President and Prime Minister of the UAE and Ruler of Dubai has announced on Twitter that the regulatory framework to start issuing long-term residence permits for investors, entrepreneurs, innovators and specialised talents is now in place. Departments in the UAE will now start receiving applications, he tweeted on Monday. “The UAE has been and will remain a destination for talents ... and a land to fulfil the dreams of all pioneers,” said Shaikh Mohammad in a tweet.